Fun fact about me: I am a university student, I am 20 years old, and while I do work very hard - I have very little money to show for my work. Between trying to enjoy going out for dinner with friends and paying for my car that broke down yesterday, I don't have much money left. Like a lot of people with disabilities I have plenty of things I want and need. I prioritize. I make sure I buy my meds every month. I try to have money spare in case I need to go to the hospital. I pay for my subscription to my AAC (PogoBoards). I am saving up money to buy a medic alert bracelet. AFOs are in the future. One thing that I started to need, but was not in my budget, was an arm brace for my left arm. My left arm prefers to be in a bent position, to the point where it is now causing other problems. To make things more complicated, I am left-handed. I need to keep my strength and function in my left hand and arm. But an arm brace wasn't in my budget. I genuinely live pay cheque to pay cheque. But I build a lot of things. 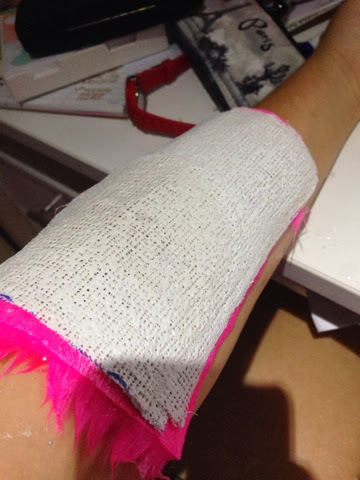 I have built tools for special school in the past, and now I have built an arm brace for myself using only: plaster wrap, faux fur, cotton, velcro. Only about 10dollars worth of material, and it took me less than a week to make. That photo shows how it start: a piece of faux fur, with some plaster of paris on top. 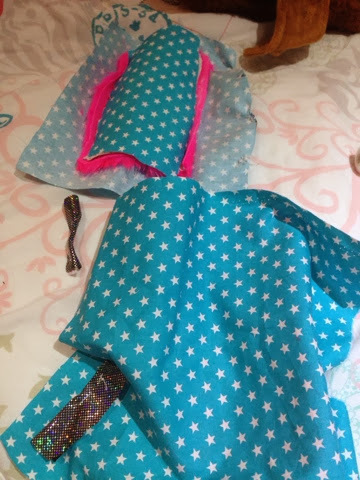 The faux fur is to stop it from rubbing. 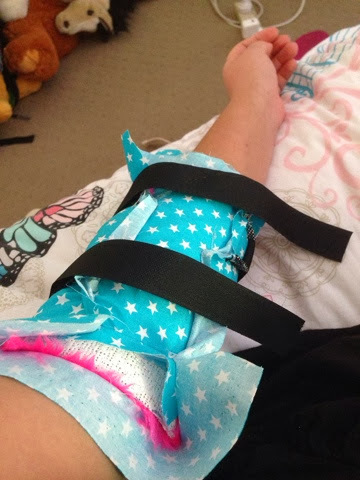 I then covered it with cotton, so that I would not get overly sweaty when wearing the brace. As you can see, there are two braces here - I did it in a clamshell style design. And this is the final product. Is it neat and tidy? Definitely not, Does it look professional? Nope. But it was cheap, it was easy and it works. I also personally like the pink and blue with white stars. I try to wear the brace everyday. It's not enjoyable wearing it, but it is for a better purpose. That is true brilliance, and it's cute! You are very creative and resourceful! If it does what you need it to do that's the important thing! Hope to see you tomorrow at Friendship Friday!